Summer in London last year stretched until September, and I managed to kid myself that it was still summer until about mid-October. Realising that the temperatures were plummeting pretty quickly, i reluctantly pulled out my navy trench coat out from the back of the cupboard. But – disaster. It no longer fit me. I never set out with any aim to lose weight, my diet hasn’t changed, and I made no efforts to change my figure. I have body dysmorphia, and my changing body has made me less able to rely on the ‘safe’ clothes I wear when i have bad days – even my old safe clothes don’t fit now. I no longer know, or trust, my body, and that causes some level of psychological difficulty. Readjusting is hard, when you spend your life pretending you’ve adjusted. If you’ve shrunk out of all your clothes, replacing everything gets pretty expensive. Literally nothing fits. I have spent so much money on clothes, and I really need to learn how to sew. I struggled through November and December layering cardigans underneath a denim jacket, or my favourite jacket (a faux leather bolero I bought in my first ever purchase from American retailer Pinup Girl Clothing!) with a couple of scarves and a pair of gloves, but I got to Christmas and I realised it just wasn’t enough. If i wanted to survive until summer, I needed to find myself something warm to wear. And here the anxiety starts – I love pinup style clothing, but I find shopping a stress, and I hated the idea of trying on hundreds of coats or panic-buying one that didn’t fit. You can’t really hide if a coat doesn’t fit you. I’d already tried on all the coats in M&S and Next, but the only sizes that fitted my waist were a size 6, and they hardly accommodated for my, um, ‘generous’ curves. They also lacked a vintage aesthetic. It struck me that I could have a look around for some coats I liked online, that accentuated the waist and flowed out across the hips, and try and hook one on the Boxing Day sales – it would mean spending less, and perhaps even justifying buying two and then sending them back if they didn’t fit. It needed pockets. I am so fed up of coats with pretend pockets in them – if you’re not going to bother putting them in, don’t pretend you thought about it! It needed to be warm; I love the Pearl Collectif coat but i felt it might be too long-waisted for my figure. However, I was in love with the cuffs and the lovely faux-fur neckline! It needed buttons at the front, so I can cocoon myself inside it and button away the cold. None of this zip rubbish, and forget coats that don’t even do up at the front! I’m freezing just thinking about them. Brr. It needed to accentuate my tiniest part, my 27.5” waist, with about an inch to move around in so I can layer with jumpers and cardigans. It needed to be generous enough to accommodate both my bust and my hips (37”, and 39” respectively) and preferably skim over my hips. It needed to have enough of a flare in the skirted part to allow me to wear my ploofiest petticoats underneath, and still close over them! Preferably, it needed to be vintage compatible, so it didn’t look out of place with my 1950s wardrobe. 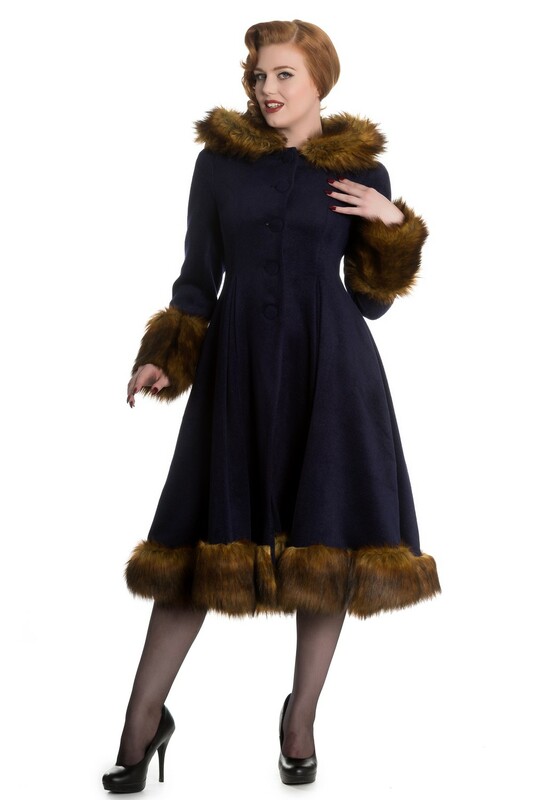 Cons: Unsure about the sizing in reality, and whether this coat could tame the petticoats! I saw a review by Miss Amy May and instantly wanted to buy this! The addition of a hood is just too cute for words, and then I saw Miss Victory Violet in it and I knew this was a coat I had to track down. Then I saw the price. Eep. Pros: Hood! Fluff! Pockets! Ahhhh! Cons: Bloody hell it’s expensive. Just before the sales were announced across most of the vintage retailers, I had a long think (about five minutes) – and I decided to go on an online hunt for an Isadora/Elvira coat. The sizing guide for it seemed to fit my figure best, and I loved the generous swing of the skirt. And that hood!! Hell Bunny were offering 20% off over the festive period, but I felt this still made it a little dear. Collectif generally hold 50% sales in the first days of the New Year, and I knew the Gina was likely to be up for grabs. It was in a camel and black colouring, rather than the blue and black that are still available on the Hell Bunny website, and it blew my socks off. Not just because it had the pockets, the fluff, but – it was SO CHEAP! I spotted it on eBay, as new, by a seller who clearly hadn’t realised what a vintage repro diamond they had on their hands. To be honest, with no hood being the only real con I could find, I wondered whether such a low price would be a con. Despite worrying about whether it was legit, I felt that this was a deal I could NOT leave behind me! I pressed the ‘buy it now button’ and prayed that it would be the miracle coat I hoped it would be – and if it didn’t fit, I could always pop it back up on eBay. For £29, it seemed worth the risk, and a lot better than the £99 retailing price. Whilst I waited for my coat to be delivered, the Collectif sale arrived. And I spotted the Gina – down to about £40. There was a worry in my head about there being an issue with the Hell Bunny coat, and I pondered for about an hour with the Gina going in and out of my shopping basket. Then I just took the risk – and figured, I could always return it if there was an issue, right? Let’s fast forwards to April. Short story: the Hell Bunny coat is the most perfect coat there has ever been. I’ll do a full review later. And the Gina coat arrived too, and the skirt is less generous as I had thought, but it fits like a glove! So…I kept both. Considering that at full price these would have cost me about £220, and I bought them both for less than £70 (a mere 31% of the original price!) it seems worth it to not have to go through the ho-ha of finding the perfect winter coat for another couple of years! Longer story: luckily, the size guides for Hell Bunny and Collectif are pretty accurate, if not a little generous, and DEFINITELY follow them if you’re unsure on sizing. The other thing I’ve learned is that vintage repro coats are quite rare to find on eBay, despite finding my wildcard Vivien on there, and I recommend waiting for the Collectif sales to pick up one of their gorgeous pieces at a discounted price, and look out for third party sellers for Hell Bunny. You can sometimes pick up some discounts throughout the year, just after New Year, around Easter, in about August, and around Black Friday in November. Definitely save up, and splash out when it comes to sale time, if you are flexible with the pieces you’d like to buy. I heartily recommend that you have a look at Miss Amy May’s blog too, where she often shares discount codes for items. So – Vivien and Gina are hanging in my hallway, and I have survived the past four months without dying of frostbite. Hurrah! It’s worth noting that my Hell Bunny coat is incredibly warm, and I always get compliments when I wear it, so if you’re thinking about investing in a coat do have a look at their collection. They’ve also just released a line of gorgeous summery skirts I’ve got my beady eye on – like this orange somerset apples skirt! What has been your go-to vintage coat to get you through the winter months? Previous Post It’s my birthdate anniversary…yet another year bites the dust! I AM SO HAPPY YOU’VE UPDATED THAT WORDS ARE INSUFFICIENT!! And ‘bloody hell its expensive’ ?? VERY TRUE! I finally bit the bullet on the Pearl this year and it was all my discretionary spending for three weeks. What a lucky eBay find!